Dong Phong Art Gallery is pleased to announce the solo exhibition “Du Ca” (Sing and Dance) by artist Doan Xuan Tang at Dong Phong Art Gallery, No 3 Ly Dao Thanh Street, Hanoi from 1st November to 30th November, 2017. Opening reception starts at 6 p.m on 1st November. The artist will show his latest paintings at the exhibition, featuring landscapes and people of the mountainous area Du Ca. The paintings are done in acrylic, charcoal, golden leaves on paper and canvas. In “Du Ca”, mountain ranges are covered in clouds all year round. The bare feet were dyed by the miracle on top of the mountain. The bare feet “dance and sing” with the clouds and the wind. They wander through the mountains, drop into deep valleys, traverse streams beneath the sun, and suddenly fly off into infinite space. 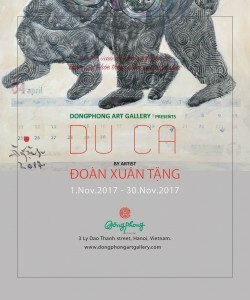 To the artist, “Du Ca” (Sing and dance) in this private world, this scene, this culture is always full of emotions and joys. Exhibition will be open every day of the week to welcome all art lovers.